How does workers’ compensation protect North Carolina workers? What types of workers’ comp benefits are available after a Charlotte work injury? Can you ever sue for a workplace injury? How can a Charlotte workers’ compensation attorney in North Carolina help you? Under workers’ compensation laws in North Carolina, most workers who get hurt doing any job-related task are entitled to benefits. This includes workers who get hurt at the regular job site or when off-site doing any required employment tasks. Workers who suffer from repetitive stress or occupational injuries or who get sick from exposure to chemicals or toxins at work are also covered. To ensure virtually all workers are provided for after an on-the-job injury, you do not have to show your employer was careless, negligent or did anything wrong to get workers’ comp benefits… unlike with a personal injury case. Workers’ compensation insurance covers all work injuries regardless of their cause because the goal is to provide protection for workers. What Types of Workers’ Compensation Benefits Are Available after a Charlotte, NC Work Injury? Workers’ compensation benefits serve as a safety net and are paid through the workers’ compensation insurance policy that nearly all employers are required to carry. Unfortunately, sometimes your claim for benefits will be unfairly denied, or you will find yourself having to fight to get your bills paid or your disability coverage. When this occurs, it is important to contact a Charlotte workers’ compensation attorney in North Carolina. At Auger & Auger, we have over 20 years experience helping clients get their benefits. We will put our experience to work for you. Can You Ever Sue for a Work Injury? Workers’ compensation provides broad protection because you don’t have to prove negligence, but it is also limiting because it is the exclusive remedy for workers hurt at work. You cannot sue your employer for an on-the-job injury; you have to make a workers’ compensation claim. Sometimes, however, a third party may be to blame for your work accident or work injuries. For example, if you got hurt on a defective piece of equipment, then the equipment manufacturer could be a potential defendant in a personal injury lawsuit. Personal injury claims cover damages for pain and suffering, emotional distress and other losses not covered by workers’ compensation. 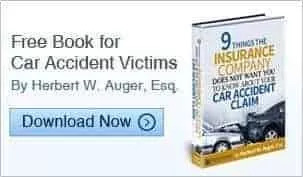 The Charlotte, NC workers’ compensation lawyers at Auger & Auger provide free consultations to determine if you may have a third-party injury claim after your work accident. Auger & Auger provides free and confidential consultations to clients who got hurt at work to help to determine if you can benefit from our assistance with a workers’ compensation claim. If the nature of your injuries prevents you from coming to see us, we will come to your home or the hospital. For more information, see frequently asked workers’ comp questions.